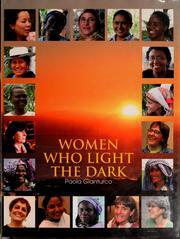 Women Who Light the Dark is a richly textured book chronicling the voices of women who are triumphing over difficult lives. Through these photographs we see the faces of women whose eyes shine with light. In the accompanying text, we hear them speak of of commitment, of determination in the face of obstacles. These are people who love life, and their words speak of confronting the obstacles in front of them so they may create change by their presence on the earth. Allowing these women to speak for themselves, Gianturco elicits stories that reflect the power of the human imagination. In the face of the most hopeless situation, many of these stories tell us, imagination takes flight and a solution is born. Others illustrate the healing power of art. As ancient as time itself, the enactment of our human dramas through theater, music and dance shines a light on the dilemmas we face and has the power to affect change. One senses Gianturco&#039;s awe for the people who have used our most powerful human tools to face the direst of human experiences. &#039;Inspirational&#039; is a heavily abused word, one that often is accompanied by drawings of cute little puppies and kittens frolicking in an Edenic world. There are no cartoon animals at play here, but we dare to use the word because this is a book that inspires to action. Women Who Light the Dark can only be called inspirational.